Looking northward from Anticline Overlook, visitors will see a rather interesting site; a line of sandstone featuring arches, caves and a parade of elephants. 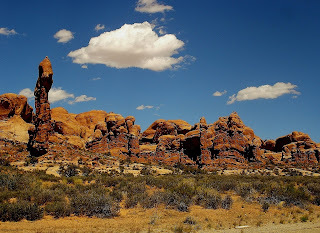 How correct they would be as this is the Cove of Caves, Windows District and Garden of Eden section of Arches National Park as seen from miles and miles away. 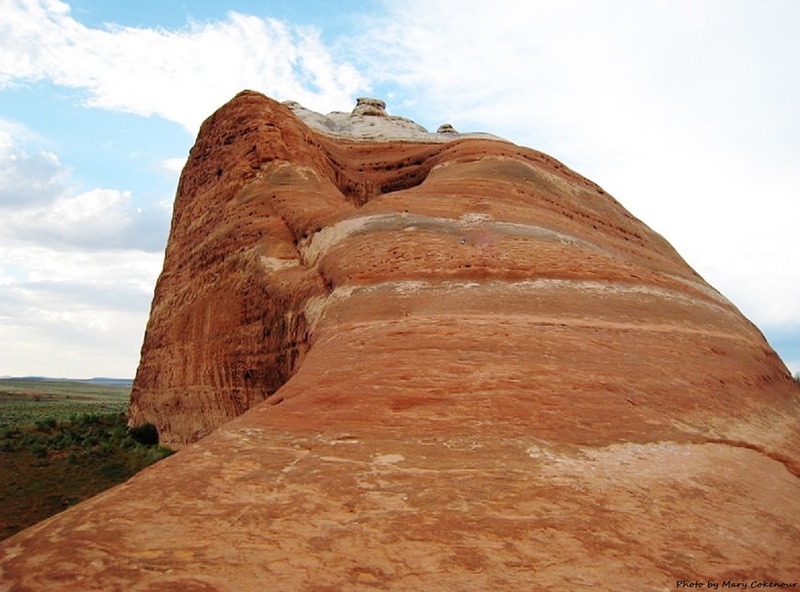 After visiting Balanced Rock, there is a paved road nearby leading to the right and this will take you to this mysterious place. The background photo I use for this blog (behind the title) was taken at a pull-in area only minutes from the main road. The Garden of Eden is a collection of sandstone spires; it's not unusual to see ropes hanging down, climbers attempting to be "on top of the world". Two of the formations are said to resemble "Adam and Eve", hence the name given to the area. Continuing along the paved road brings you past the "Cove of Caves", aptly named due to the cave like indentations in the sandstone walls. Eventually the largest of these alcoves will erode into an arch; when is a good question and it all depends on the elements of wind and rain. The best is yet to come as you reach the Windows District (North and South Windows), Turret Arch, Double Arch and the Parade of Elephants. Not only is there so much to gaze and wonder upon, but you can hike up and around the North Window via a primitive path. The primitive path is over the sandy desert to the far sandstone wall; there is necessary climbing over boulders; the view is amazing and the coolest wind blows through. It's a pleasant place to sit upon one of the larger rocks, enjoy the view and breeze, before continuing the hike to North Window where you can walk through it to the paved pathway leading back to the parking area. The North and South Windows are also referred to as "The Spectacles" with the wall between them as the "Nose Bridge". From the parking area by Windows, you can see "The Parade of Elephants" where Elephant Arch makes the opening between the "legs" of one of the stone creatures as they march in formation. Then there is another famously photographed arch, "Double Arch" which technically are not arches at all. They are actually a perforated sandstone fin and a giant pothole that finally lost its bottom; but who cares, they're beautiful. This arch has also been referred to as "Double O Arch". While you are photographing and gazing at the various arches; don't be surprised if one of the locals flies in to tell you stories from its own perspective. The Raven is very talkative and informative; it will fly away when it's finished wearing down your ears as fast as it flew in. This tour guide is unpaid, and doesn't mind showing you around. That takes care of this section of Arches National Park; do NOT miss out on it. The legend of Dead Horse Point originates in the 1800s when cowboys would round up the wild mustangs that roamed around the mesa. They would corral them down at "The Neck", pick out the best of the herd and let the others go free. However, for whatever reason, one day the mustangs not chosen were left in the corral and forgotten about. They died of thirst with the Colorado River in full sight, 2000 feet below them. We don't truly know how the cowboys felt about what they had done; we can only hope their humanity kicked in with feelings of regret and remorse. It is said that at night, campers can hear the mournful cries of the horses being carried on the wind through the canyons. From the viewpoint, looking below, the form of a white horse can be seen; a ghost to remind us of the wild horses who tragically passed away. 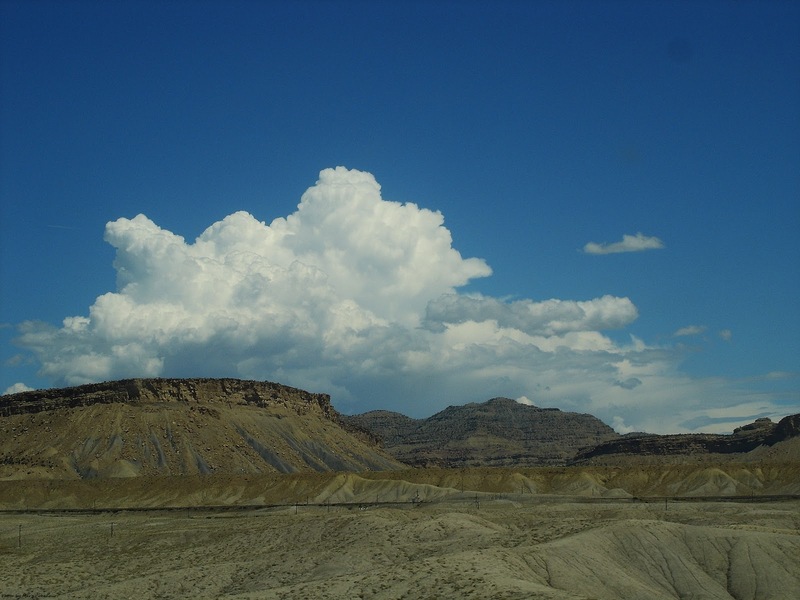 From Moab, along Route 191, the entrance to Dead Horse Point State Park, and Canyonlands - Island in the Sky, is about 10 miles to Route 313; another 18 miles to the State Park itself. After parking and checking in at the Visitor's Center, the Overlook is along a paved, upward incline, walkway. The walled viewing center is shaded for the most part, but you want to get close enough to the wall to be able to see as far as the eye can see. Straight ahead is the most photographed site of the park, "The Gooseneck" aka "The Neck". As with the Grand Canyon, the ever moving Colorado River carved out this formation; in fact, Dead Horse Point is also known as Utah's "Little Grand Canyon". It was here that the actual Grand Canyon scene from the movie, "Thelma and Louise", was filmed. The Overlook is surrounded by sandstone; juniper trees, shaped by the wind, grow strong between the stones. To the East is Cane Creek Anticline and the Solar Potash Collection Ponds. 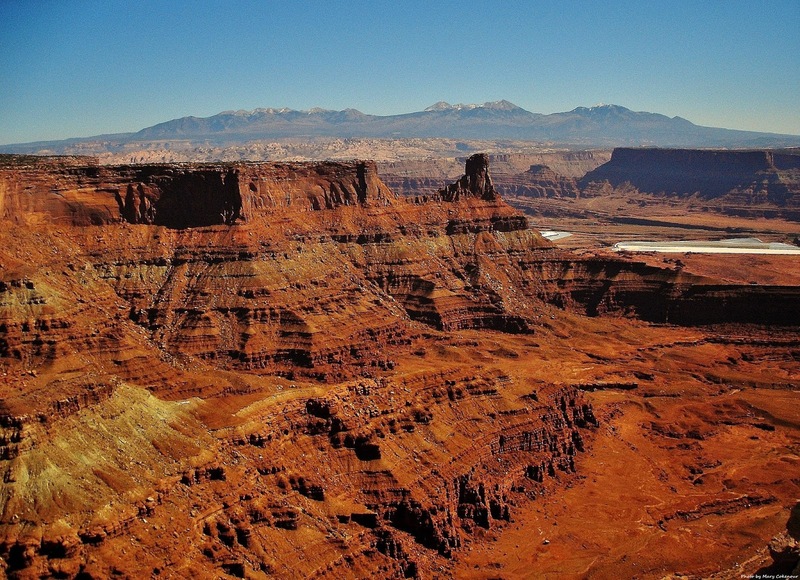 Down below is Shafer Basin and Shafer Trail (originally used to bring cattle down to the water), while looking southward is Pyramid Butte and Pyramid Canyon; further on, Islands in the Sky can be spied. 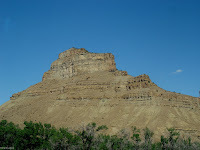 Westward is a desert tower known as "Big Chief" keeping a watchful eye over his canyon. Looking to the North, Merrimac and Monitor Buttes can be seen; they can be reached via trails from Mill Canyon Road. 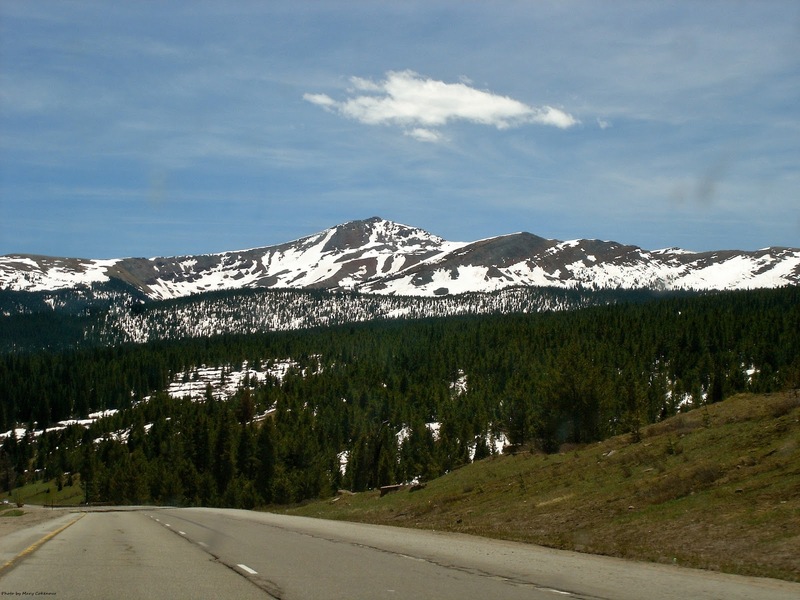 Besides the Overlooks, there are many trails that can be hiked, and while camping sites are available, better make reservations or you'll be out of luck staying overnight at the park. 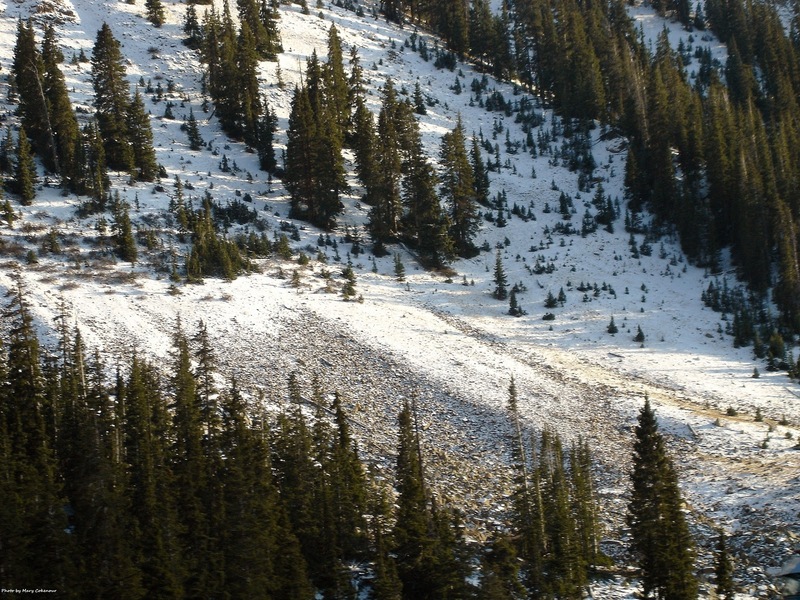 Invest in ATV or 4 wheel drive maps for traveling over the Basin; it doesn't hurt to carry a map of the hiking trails either. Want more? You can always get back on Route 313 and see what surprises Islands in the Sky has in store. Enjoy it all !!! Back in 2006, Roy decided it was time to go meet his family; in other words, see what they thought of me, and how we all got along. His mother and brother still live in Moab, Utah while one of his stepmothers and half sisters live in Farmington, New Mexico. With our jobs back then, we could only take a little vacation time and we had to factor in that neither of us wanted to fly; two days to drive there, two days to drive back and five days of actual visiting...nine days total. So in the middle of May, off we drove to Utah and I am so totally, 100 percent happy that we did; I got to finally see parts of the United States I thought I'd never see. Sorry Kansas, but you're one state I could do without...6 hours of flat, brown land and not much else to see. 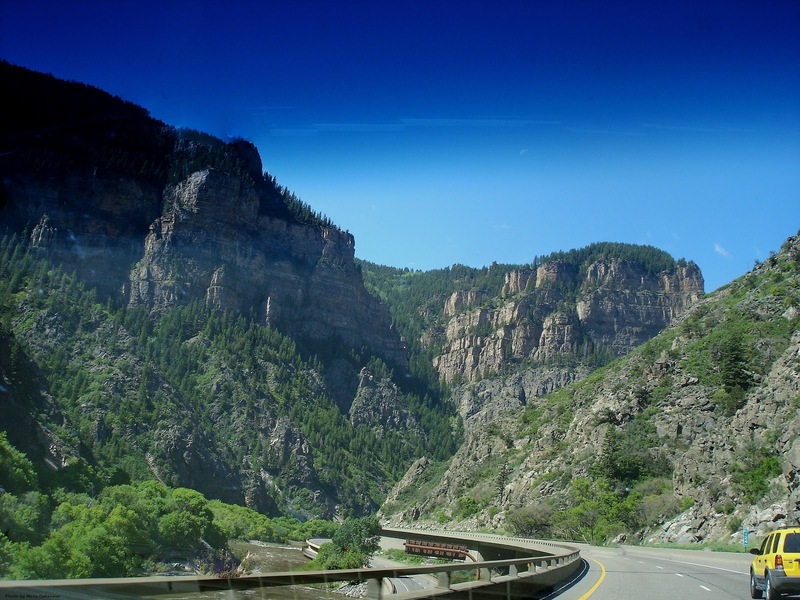 We traveled Interstate 70 which we could pick up in Pennsylvania (where we lived then) and drive all the way through to Utah. 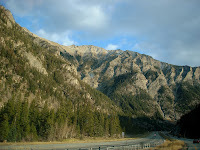 The drive was long, sometimes tedious; we took turns sleeping and driving, so we wouldn't have to waste time nor money staying overnight at a motel. There was time to sleep once we checked in at our hotel in Moab; the Best Western Greenwell Inn. 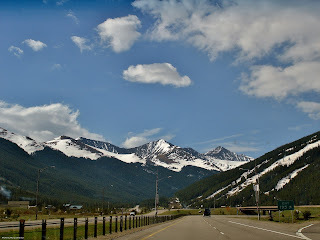 Anyway what I truly want you to know about is my first introduction, up close and personal, with the Rocky Mountains. 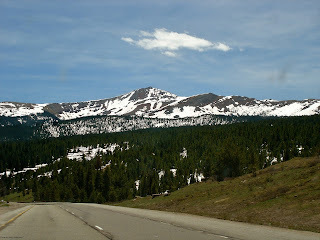 No photo or video can ever do them justice; the reality of the Rockies is so intense...emotional...stunning. Roy stated that I basically hugged the windows of the car with my mouth hanging open in astonishment. At rest stops I couldn't breathe enough of that cool, clean air; couldn't feel enough of it on my skin; I loved touching the stone of the mountains; feeling the tingle of any snow that was still in the area on my fingers. 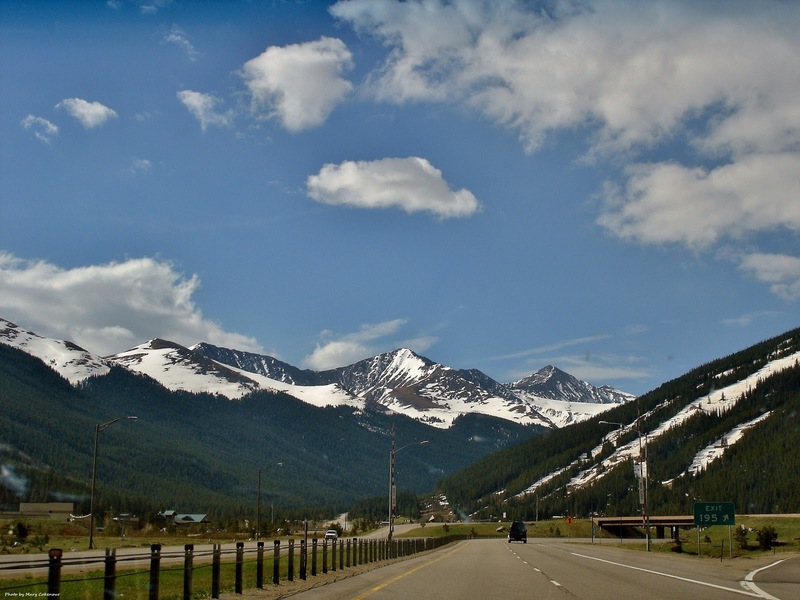 Whenever I hear anyone is traveling from the East coast out West, I tell them that they must either drive; or if flying, get off in Denver, rent a vehicle and drive through the Rocky Mountains. It is an experience that should never, ever be missed out on. 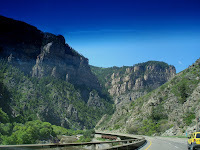 We drove through the Rockies again in October 2008; and finally May 2009 when we did our final move to Monticello, Utah....the feelings, the awe, the amazement of the Rocky Mountains did not change. 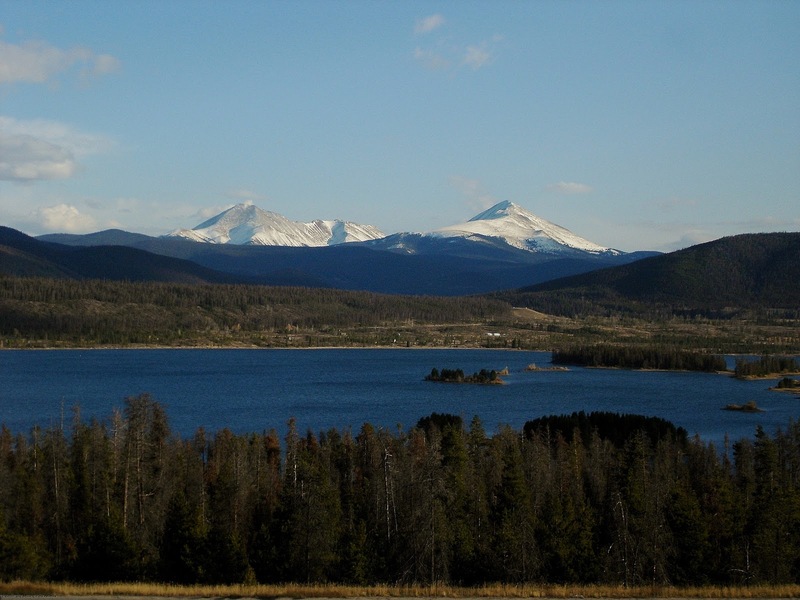 Two popular rest stop areas is Lake Dillon or Beaver Creek. 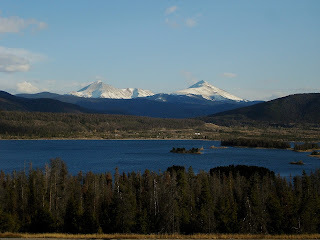 The rest stop at Lake Dillon overlooks the area and the view is breath taking. 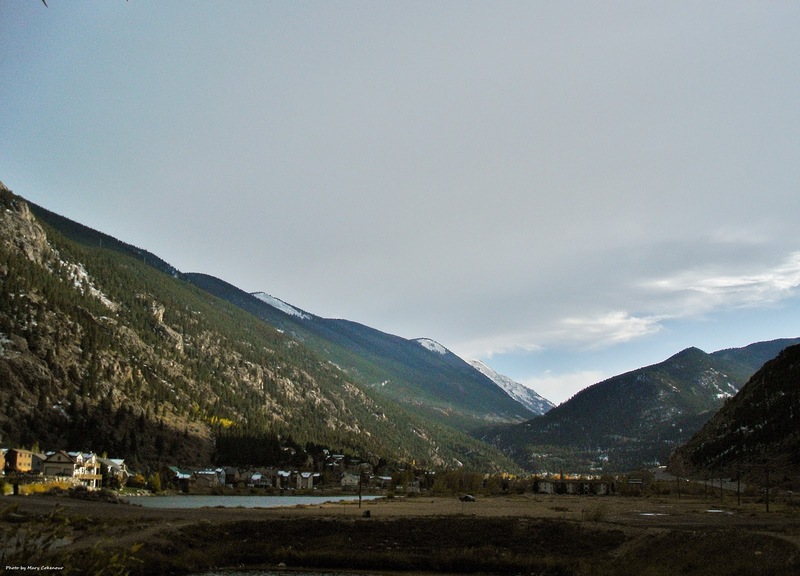 Beaver Creek is a small mountain town which surrounds a lake; quaint and picturesque. We stopped in Vail to gas up the car; funny, but we did that all three trips. 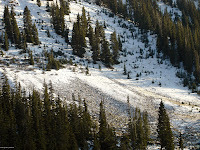 Vail is the typical ski town; crowded and over priced. In October, even though there was natural snow on the mountains, the snow machines were working full force to accommodate the skiers. As you begin to descend from the Rockies towards Utah, you start to notice a distinct change in the landscape. Like I said before, you can "ooh and aah" at photos or videos of the Rocky Mountains, but you won't get the true experience of them unless you're up close and personal. Oh, an instance that occurred all three times while going through; a herd of Big Horned Sheep along the roadside...a ram and his ladies. Of course there was no where to pull off, so a photo could be taken, and I swear that is how those creatures planned it out. However, if you get to see them, you are so lucky as they are amazing animals; large, majestic and beautiful; just like the Rocky Mountains they reside in. 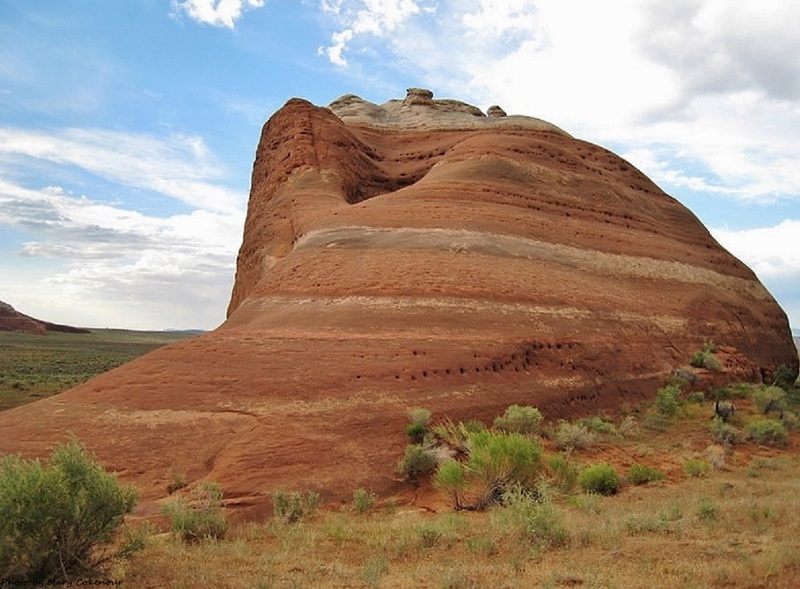 Two different legends about this sandstone pillar I'll be telling you about, Jail Rock aka Jail House Rock; located on CR 137 (south side) in Canyon Rims Recreation Area. Now CR 137, about one mile from the entrance to the Rims, off Route 191, is one of those, "I wonder where this goes? ", type of roads. Looking northward, there is a square, blue background sign which states San Juan County 137, and so we followed it to a locked gate, but we could see Looking Glass Road and the Rockland Ranch beyond. Talk about third time being the charm! Basically this is BLM land, but you can go traveling onto it as long as you pay attention to the signs: Please Close Gate - there is most likely cattle gazing on the land, and you don't want them getting loose and wandering onto the highway; Private Property or No Trespassing - it is what it is; keep out! Following this dirt trail, you'll eventually either have to turn right or turn left; a flip of a coin had us traveling to the right where we passed sandstone wall after sandstone wall full of, what I like to call, amphitheatres; some barely formed, some fairly deep. The trail finally ended in a "boxed" canyon and hidden among the trees was a cattle corral. The scenery surrounding us was outstanding! A little more back tracking and we were at another gate, cattle corral next to it, but beyond was our ultimate goal - Jail Rock aka Jail House Rock. Those legends I mentioned earlier? 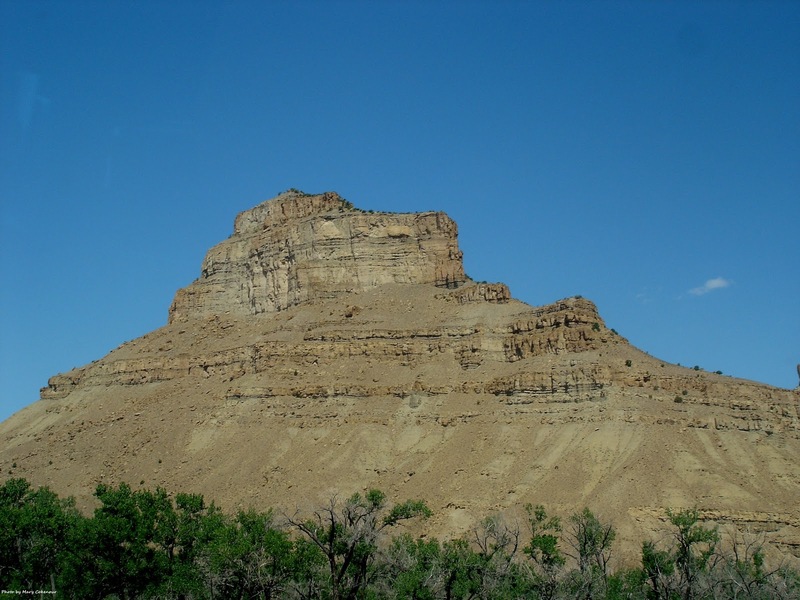 One is that in the early 1900s, rancher John Jackson would put his wife down into the 15 foot deep pothole, at the top of Jail Rock, to "keep her safe" while he was at one of the saloons in either Monticello or Moab. The other legend is that the local sheriff and his posse used Jail Rock to hold outlaws they caught before they could be hauled off to the local jail itself. 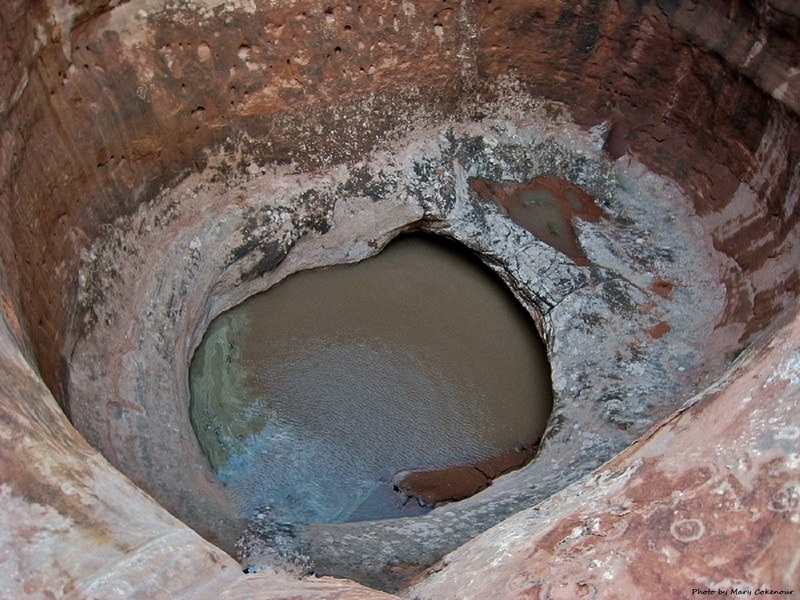 The climb up to the pothole is about a 45 degree angle along smooth sandstone. The view from up top is amazing, but the one below is just as awesome. You won't need climbing gear to get up to the top, but you will need it if you want to get to the bottom of the pothole, and back up again. Next to Jail Rock is a formation I like to refer to as a "gated" amphitheatre; looking at it straight on it appears as if two pillars of a gate surround a sloped opening. 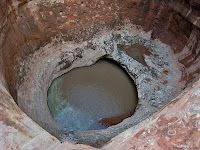 However, if you look at it from the side, it has the appearance of a skull face. This is where fans of the cartoon series, "He Man", should now be shouting, "By the Power of Grey Skull !!!" Now you have to be aware that the local residents of this area are, shall we say, a bit on the loupy side of life. They run around willey-nilley not heeding any moving vehicles; their homes are everywhere, including on the dirt trails themselves. Drive slowly as you never know when a head will suddenly pop up out of the ground; a fisted, furry paw shaking at you; as this little resident jabbers obscenities at having his privacy invaded. I'm speaking about, of course, the local prairie dog populace. Remember, all the trails I have been writing about are dirt and a 4 wheel drive vehicle is your best bet for traveling over them. Pay attention to posted signs; have an overall great time exploring.